This entry was posted in Mongolian Quilting Center, Quilts, Travel and tagged Mongolian Quilting Center, quilts by Maggie Ball. Bookmark the permalink. 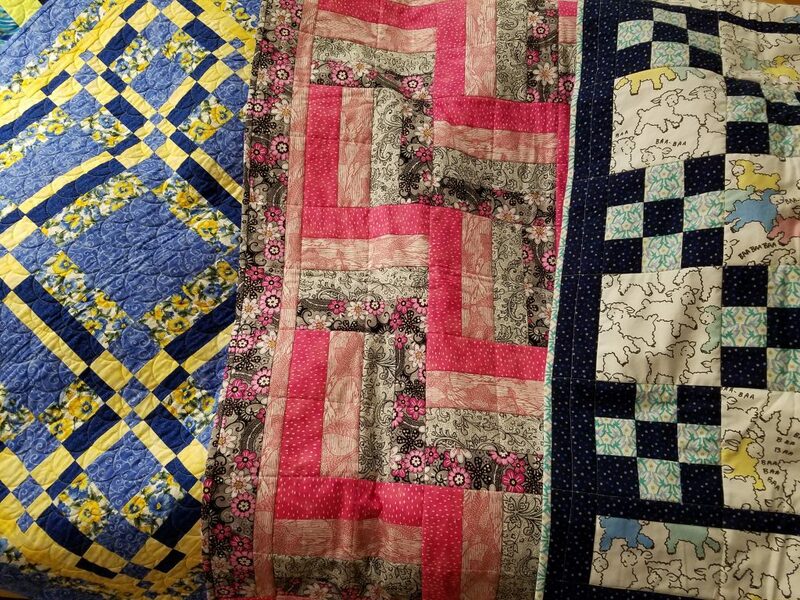 I have a quilt that I would like to donate……if you are accepting modern quilts. Thank you Su, your quilt is so bright and cheerful and will be greatly appreciated. I just saw the quilts for Mongolian children project. I would love to add to the collection. If you’d like to send a pattern I will be happy to get the fabric. Are you looking for cotton or flannel and with or without batting? I can reach out to some other folks as well and will be passing this information along. Thank you for being a wonderful partner for Selenge! Thank you Rex. The pattern may be very simple. We have made several from 6″ 4-patches alternated with 6″ squares (strips for 4-patches cut 3-1/2″, squares cut 6-1/2″), and some from 5″ cut squares (7 x 6). Then 2-1/2″ border strips may be added to these. Rail Fence is another easy pattern using 2-1/2″ cut strips. Cotton or flannel is fine, with batting. I am still quilting, and would love to make a baby quilt for your trip to Mongolia. What wadding is best – I do have 80/20 but will get cotton if you think that is better? We are just trying to get away from winter here, but having had some beautiful weather, are back to cold, with rain and hail. We are promised better weather towards the w/e. My daughter is also a very prolific quilter. She did finish the quilt started with you, and just last year got it quilted (by herself) on a Sweet Sixteen . She is very proud of it. Are you likely to be over here again? We would love to see you again. Thank you Ruth. We’ve had a wonderful response to this project and will be exceeding our goal of 50-60 quilts. We can visit hospitals in Ulaanbaatar as well as the rural hospitals to find homes for these lovely quilts and there will be no shortage of demand. We’ve also had cash donations to help defray the costs of batting and shipping to Mongolia. People are really embracing this outreach and it is heartwarming. Thanks for the reply, let me know exact dates , please as it would be great to catch up. We have a regular meeting at the hall where you gave us a wonderful w/s, on 2nd and 4th Tuesday in the month. If you have time, Emma would love to show you her quilt. Perhaps we could organise a talk / w/s at least to ‘spread the word’ ? Thanks Maggie! Have one finished and another under way. Only question- how to get them to you? Ship to your address or are you planning a collection point? Also working with Viking and Quality shops to get the word out through my network.